The most reliable solution. Ensured alarm transmission during power, internet or phone outages, even if the panel is removed or broken. Our award-winning mobile app allows you to control your system from anywhere. Works with phones, tablets, Apple watch, Alexa and Google Home. Customized notifications so you’ll know who’s coming and going. Reminders so you’ll never forget to arm your security system again. Manage your home’s security with a powerful app that is straightforward and easy to use. Quickly check system and sensor status and view activity history. Arm or disarm with one click. We’re constantly adding new features to make your life more simple and secure. Use your smart phone, computer, tablet, smart watch or your voice to control your system from anywhere. Once your smart security system is installed, download the Alarm.com app for free from the App Store on your device. 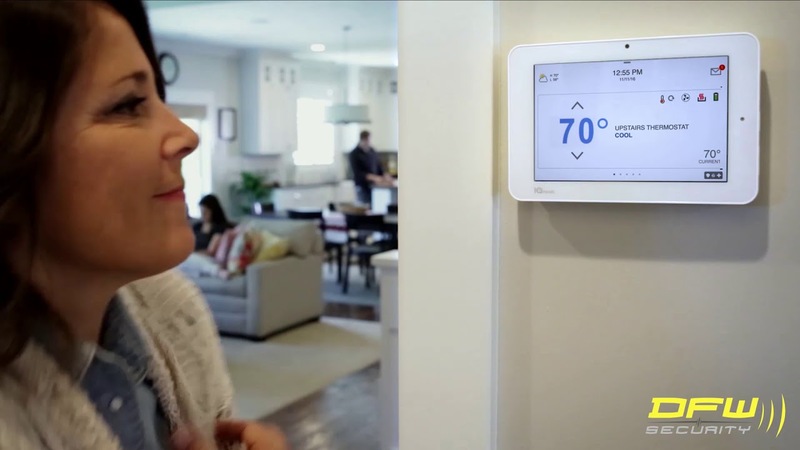 Our Security Panel also acts as a hub for smart home technology like thermostats, lights, cameras, locks and garage doors. Home Automation components can be added and seamlessly controlled in the same app. Two Way Communication, also known as 2-Way Voice, allows for faster communication in an emergency, because our monitoring agent can speak directly into your home through the loudspeaker on your keypad. If an agent hears activity in the home, but no password is given, the police will respond even faster to what’s called a “verified alarm”, saving precious seconds. If an alarm is accidentally triggered in your home, you can cancel it quickly and easily by speaking directly to our agents through your keypad. A “crash & smash” burglary is one where a crafty thief disables or destroys the security system before it can send an alarm signal to the monitoring center. While traditional alarm systems offered no protection from this threat, our special patented technology provides a solution to make the crash and smash burglary technique a thing of the past. If a door opens when we know the security system is armed, but we don’t quickly receive a disarm signal, the police are dispatched, and the homeowner is notified of a possible burglary. Text and email alerts from DFW Security ensure you are instantly notified about any type of alarm at your home or business, as well as other activity you want to know about. Home Security is what we do, and we’ve been doing it well for over 25 years. Why not trust the experts to make sure your smart security installation is done right? Our licensed, experienced, background checked, drug tested employees will ensure the best selection and placement of components to protect your home and family. And we won’t leave until you are completely satisfied and fully comfortable with how to operate your new smart system and app.